Unlike athletic shoes, Heel Protectors (Plastic Heel Cups) never wear out. As shoes provide less support, the Heel Protector takes up the slack. -Price is per dozen heel cups. -The plastic heel cup protectors provide comfort and protection and relieve heel and lower leg pain for jumpers, hurdlers, runners, and walkers. -The cups mold to your foot's contour. -Heel Protectors are lightweight, but they absorb blows and will not fall apart or deteriorate after constant use. -The material is exceptionally strong, very pliable, and ultra thin. -Fits comfortably around the heel – can be worn over or under a sock. -Proven performance since 1960 at a reasonable price! -Place heel cup protector inside the shoe with the star down and forward. -Most people wear it over the sock. 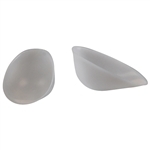 -Place plastic heel cup protector in warm/hot water. -Plastic heel protector will become pliable. -With the heel protector in the shoe, step into it. -Allow to custom mold for 2 minutes. -Remove from shoe and let plastic set for 10 minutes. -The plastic heel protector should feel like a second skin, if not just remold it.